Wasps and bees are beneficial insects, although they are generally considered to be pests because of their ability to sting. 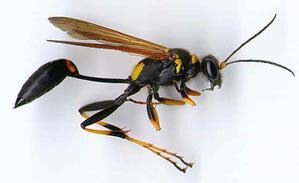 Wasps, in particular, can become a problem in autumn when they may disrupt many outdoor activities. Wasps are venomous. Wasps, bees and hornets can pose a serious health hazard to anyone with allergies, including swelling, hives, difficulty breathing, and in some cases even death. Wasps can make nests in the eaves and ledges of your home, trees, in the ground and even inside your home. Pest Solutions 365 can determine the size of infestation and pest control needs of your home with a professional pest audit. Only $25 for a 20-minute inspection. Getting rid of bees, wasps and hornets usually requires professional attention. Although sprays and home treatments may provide temporary relief, we highly recommend you call Pest Solutions 365 as soon as possible so we can permanently get rid of the pests. Wait to serve food and drink until you’re ready to eat. Promptly put away food when done, and throw garbage into a container with a tightly fitting lid. Examine glasses, cans and other containers before drinking from them to check for wasps that may have flown inside. If a bee or wasp flies to your food, wait for it to fly away or gently brush it away. If only a few yellowjackets are bothering your activity, ignoring them or capturing them with a net and crushing them may be sufficient. Traps may catch a considerable number of wasps, but not enough are captured to noticeably reduce the wasp population in the fall. Some simple things can be done to slow the infestation in your home. Note: Do not attempt any of these steps if you are allergic to wasps or bees, or if you don’t know if you have a wasp or bee allergy. From a safe distance, locate the wasp nest. Spray the area with a killing product from the store. It will kill some of the wasps instantly. After spraying, wait a day to make sure you have killed the dwellers of the particular nest. It is important to remove the nest if possible. Make sure none of your window screens have holes. Keep all doors, windows and garage doors closed. Install insect screening over your attic vent and exhaust vents.